VE (UK) stock a great range of high quality scooter tyres from Michelin that offer excellent life and grip, with technology that has been passed down from motorcycle racing. 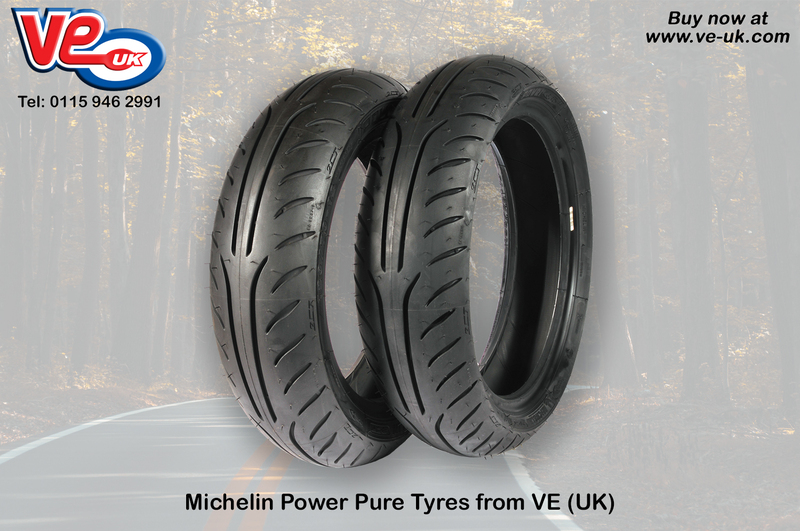 The “Power Pure” tyre from Michelin has been designed to give owners enhanced grip across the entire tread pattern, utilising a “Dual Compound” structure to promote confidence in cornering which in turn promotes safety. The centre portion of the tread features a harder compound to provide lower rolling resistance while increasing the amount of rubber in contact with the road, with the shoulders of the tyre being constructed from a softer rubber to enhance grip in the corners. The “Power Pure” tyre offers the user comfort with a sporty performance and improved tyre life. Available in 12″ and 13” fitments.